Anything that is fresh and in season anywhere in Italy! Valentino was born and raised Tuscany, Italy, in a lovely country house near Siena. Well known for his generosity and kindness, Valentino has many interests that can be summarized in his passion for traveling, race cycling, singing, and sharing his adventures with everyone. After finishing his studies in electrical engineering and working in the industry for a few years, he soon realized that his life needed to go in a different direction. He packed up and moved to Australia and New Zealand for a couple years and then traveled around Asia and Africa for many months, joining several social projects by volunteering. 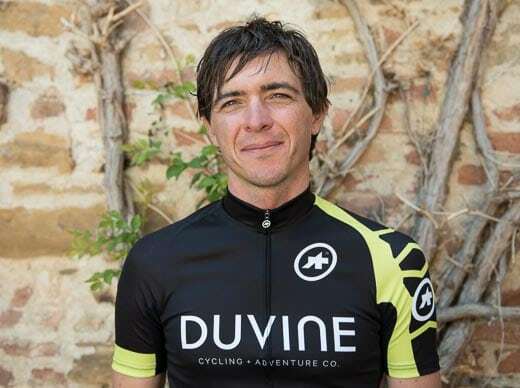 Today, Valentino lives back in his homeland of Tuscany where he loves guiding, teaching his guests biking techniques, and sharing Tuscan family recipes from his mother and grandmother. If you come on a Tuscan bike tour and have Valentino as a guide, you will surely taste his homemade olive oil, honey, or fruit jam.